Check out The Foreigner, a comedy by Larry Shue at 30 by ninety in Mandeville, LA that runs from February 17 through March 4, 2018. Performances are scheduled for Fridays and Saturdays at 8 PM and 2:30 PM on Sundays. This comedy of errors is lots of fun and revolves around two Englishmen, Charlie and Froggy, who visit a fishing lodge in Georgia. When Charlie, who is very shy, doesn’t speak when asked a question, the people at the lodge assume that Charlie and Froggy cannot understand English and the lodge residents talk freely around them and the Englishmen learn their secrets. This is where the fun begins, and you’ll see how the residents get into trouble by involving themselves in some hilarious scandals. 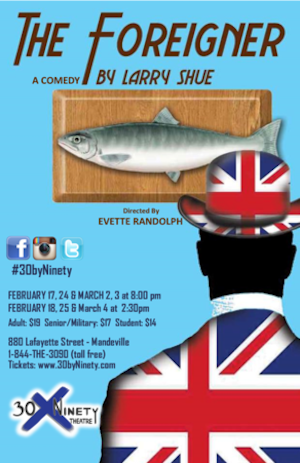 30 by Ninety Theatre is located at 880 Lafayette Street, Mandeville, LA 70448 and offers volunteer opportunities both on and off stage. For information or to purchase tickets, please call 1-844-THE-3090 or visit the website to purchase tickets, click on the following link: http://www.30byninety.com/home-1.html.